ಖ್ಯಾತ ಗಣಿತ ಶಾಸ್ತ್ರಜ್ಞ ಮಂಜುಳ್ ಭಾರ್ಗವ ಇತ್ತೀಚಿಗೆ ಚೆನ್ನೈನ ಮದ್ರಾಸ್ ಸಂಸ್ಕ್ರತ ಕಾಲೇಜಿನಲ್ಲಿ ಸಂಸ್ಕ್ರತ ಹಾಗು ಗಣಿತದ ನಡುವಿನ ಸಂಬಂಧಗಳ ಕುರಿತು ಉಪನ್ಯಾಸವೊಂದನ್ನು ನೀಡಿದರು. ಆ ಉಪನ್ಯಾಸದ ಆಯ್ದ ಭಾಗಗಳನ್ನು thewire.in ಇಂಗ್ಲೀಷ್‌ನಲ್ಲಿ ಪ್ರಕಟಿಸಿತು. ಅದನ್ನೇ ಉಲ್ಲೇಖಿಸಿ ಅದರ ‘ಅನುವಾದ’ ಇತ್ತೀಚೆಗೆ ಪ್ರಾರಂಭವಾದ ವಿಶ್ವೇಶ್ವರ ಭಟ್ಟರ ವಿಶ್ವಾವಾಣಿ ಪತ್ರಿಕೆಯಲ್ಲಿ ಚಿರಂಜೀವಿ ಭಟ್ ಎಂಬವರ ಹೆಸರಲ್ಲಿ ಪ್ರಕಟವಾಯಿತು. thewire.in ನಲ್ಲಿ ಪ್ರಕಟವಾದ ಉಪನ್ಯಾಸದ ಇಂಗ್ಲೀಷ್ ಮೂಲ ಹಾಗು ಚಿರಂಜೀವಿ ಭಟ್ ಅವರ ‘ಅನುವಾದ’ ದಲ್ಲಿರುವ ಕೆಲವು ‘ವಿಶೇಷ’ ಸಾಲುಗಳು ಇಲ್ಲಿವೆ. ಚಿರಂಜೀವಿ ಭಟ್ ಅವರು ಅನುವಾದಿಸಿರುವ’ಈ ವಿಶೇಷ ಸಾಲುಗಳು ಮೂಲ ಇಂಗ್ಲೀಷ್ ಉಪನ್ಯಾಸದಲ್ಲಿ ಎಲ್ಲಿವೆ ಎಂದು ಹುಡುಕಿ ಕೊಟ್ಟರೆ ನಿಮಗೆ ವಿಶೇಷ ಬಹುಮಾನವಿದೆ! 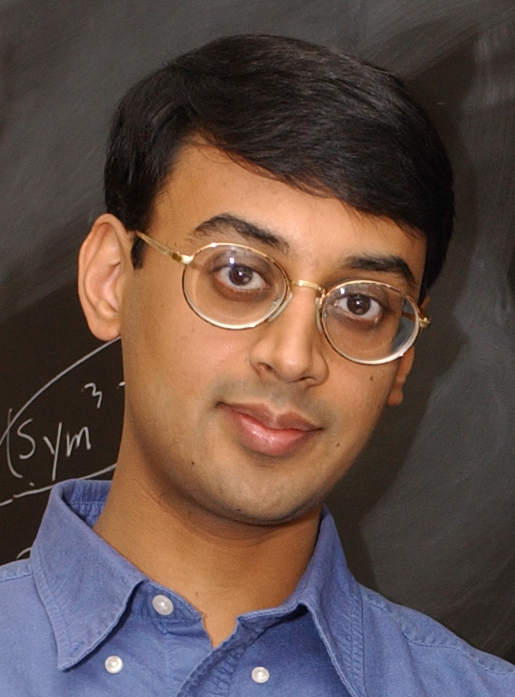 On January 2, Princeton University mathematician and 2014 Fields Medallist Manjul Bhargava delivered a lecture at the Madras Sanskrit College, Chennai, on the connection between Sanskrit and mathematics. Over 75 minutes, he touched upon ancient Indian contributions to advancing number theory and geometry, the importance of preserving their historic contexts, and what institutions like Sanskrit College can do to legitimise modern debates over India’s claims to primacy. Edited excerpts of his speech follow. I’ve always had a great interest in the history of mathematics. For me, I learned many mathematical concepts as a child through ancient Indian works. Then I would go to school and see that they were named after other people. And that got me interested in the question: why are things named the way they are and why do people not know the correct history of things? That’s what started my interest in the history of mathematics. I also found that knowing the correct history of mathematics was useful in my own research, because if you learn from the original source how an idea came about, that can give you great insight. When you learn a mathematical concept in school nowadays, you usually don’t learn it the way it was originally discovered. Instead, you learn about it all wrapped up in modern mathematical jargon collected over subsequent centuries. For me, some of the research works that I’ve done came about because I went to the original sources. In some cases these sources were Gauss and Dirichlet, and in some cases they were Pingala and Hemachandra. I went to the original sources. The ideas [there] are described in their purest form, in their simplest form, with the simplest most basic application of why they [the authors] were interested [in that subject]. By going to the original sources, instead of being influenced by what people thought about that idea over the next several centuries, you can start afresh and build your own path, starting from that seed, rather than starting with centuries of language, terminology and notation that has been loaded onto that simple concept in ensuing years. Obviously it’s worth learning any concept in the modern way, but it helps to have it supplemented with the original, historical reasons of how it came up and why it came up. That’s been very helpful to me. That’s another reason why it is important to bring out these ancient texts – because the ideas are there in their most basic form without loaded terminology. And often there are insights there that have since been forgotten! Bringing those insights back – in schools or for researchers – stimulates the mind and allows for greater creativity. That’s why for me it was helpful to have learned that way. So you probably all see in the media how there are debates about what was known in Ancient India about various mathematical things. These debates often happen not based on any particular evidence or sources. There are often two sides with their own agendas. One side says we should keep things the way they are and that nothing was known in Ancient India. Then there is another side that says we should only do things that were there in Ancient India. Often none of them are talking about any particular works or sources or evidences. They just have their own opinions. They just go back and forth debating it and neither side gives any kind of evidence for what they are saying. So a lot of this is driven by personal opinion and personal bias, rather than a scientific and historical discussion. Now we can’t necessarily blame them for it. The problem is that a lot of these ancient works are being debated, but the people who are debating them don’t know the ancient languages. And here is where this institute and Sanskrit colleges around the country can help. The reason that it is not entirely their fault is that a lot of these ancient works have no [English or other language] translation! So people are forced to have debates and there isn’t an option for them to go and look at a source that they can understand. This is where colleges like this are so important. So the other thing I really want to encourage students here to do is not just learn Sanskrit, but learn what’s in the literature and learn how to connect it to national public discussions and debates. It’s the duty of the people who actually understand the language to supply the evidence so a legitimate discussion can actively happen. If you’re learning Sanskrit, surely you have other interests too. If you have a proficiency in English or other languages you can prepare nice and accurate translations of ancient texts that are being discussed. Then you can enter the debate, and you will have an advantage because you know the sources. Or if you don’t want to enter the debate, you can give people the actual translations so that we can have an accurate, scientific and historical discussion [of what Ancient India can offer us]. You can also write about it and speak about it without agenda. Just say what’s there, because what’s there is very beautiful. As you near your graduation, you will want to think about how you can use your skills to enlighten the world. That’s what I want to encourage the students to do, going forward. Its not about learning Sanskrit for Sanskrit’s sake, but to do something for the greater good and to educate the public in an accurate and clear manner about what they are missing. Its also not just about translations – you also have to connect it to the modern way of thinking. It doesn’t suffice to say that you understand this ancient philosophical book and now I will translate it and tell people. No, there’s a whole way of how people teach and understand modern philosophy now. How does it [the traditional text] fit into there? What does it add to the way modern philosophy is thought about now? How is it different? What are insights there that are attributed wrongly now, that we can correct? So if you have interests in philosophy or mathematics, also learn it the modern way so you can connect the two. That’s also extremely important. Thus I encourage you to have an interest outside Sanskrit as well, and learn it in both the traditional and modern ways, and then help to bridge the two so that you make both stronger. India has to be its own cultural ambassador. It has to bring alive all those beautiful works of the country that are not yet known to the public at large. But it has to be done in a scientific manner and it has to be done in a correct manner. That’s why it’s important for institutions like this to do correct translations. It’s very important to have these works available in an accessible form in various languages. Whatever your skills are, please help bring alive these texts in an accurate and correct manner. Spread the word in a correct, accurate way, so that eventually the world gets to be enriched by it. That’s my suggestion. My basic point is that there are a lot of treasures in the ancient languages of India. These treasures need to be preserved. Slowly people are forgetting these ancient languages, and it is the responsibility of those who do know those ancient languages to bring to light those treasures to the public. These treasures are in every area – philosophical treasures, poetic treasures, story-telling treasures and then scientific treasures. And all of these things – they should not be forgotten. We need to do our best to keep it all alive. That’s why I salute the students of this college. What’s there in Sanskrit literature? For me, my other interest apart from Sanskrit was mathematics. So the works I concentrated on were in these areas. I am definitely not a Sanskrit scholar like you all will be. I learned enough so that I could understand the works that I was interested in. And whenever I got stuck in Sanskrit translations, I was lucky that I could just go to my grandfather and ask him ‘what does this mean?’. And he would tell me and then I would go work out the mathematics based on the translations that he helped me with. So for those of you that are interested in mathematics, I thought I would share with you some of the things I found in Sanskrit literature. All these ancient mathematical works are so beautiful and yet there are no translations available for the public. Only somebody who knows Sanskrit and knows mathematics in a modern way can appreciate these works! That’s a very tiny percentage of the population. And that’s just not acceptable – when there’s such beauty out there and only a tiny percentage of people can appreciate that. I want to give you a few examples of things that I think are not taught correctly and really need to be brought out to the public. I feel I’m not good enough of a Sanskrit scholar to do all these translations myself. I think all of you would be better qualified. I just scrapped up enough to know that there is something there, and something not quite right with the way we are being taught, and I want to pass that onto you. One thing most people do know: there’s a famous T-shirt that states ‘India’s Contribution to Mathematics is Zero’. And that statement is true, at least in one of the interpretations (laughter)… namely, that the concept of zero was invented in India, when you interpret that statement correctly. Of course, people often interpret it incorrectly. What is so amazing about the concept of zero? For one thing, it has to do with how we write numerals today. The way we write numbers today originated in India. I’m not talking about the exact shapes of the numbers, but the system of the way we write numbers. The history is that it developed in India, it got transported to the Arab world and then later it got transported to Europe. Europe learned it from the Arab world so they called it the Arabic numerals. The US continued to call it the Arabic numerals. And now India also sometimes calls it the Arabic numerals! Of course, we had to wait for the U.S. to take a leadership role in changing things as far as the correct names – India won’t. In the U.S., about a decade ago, in textbooks, they decided to call it the Hindu-Arabic numerals with the eventual goal of changing it to Hindu numerals. And then when the United States changes it, then maybe India will! But my point here is that we shouldn’t wait for that. Why can’t India take the lead in doing the research and doing what’s correct? So in this particular historical context, when you talk about Hindu contributions or Hindu civilisation you are talking about the civilisation around the Sindhu river. In this particular historical context, it’s actually not referring to religion but refers to a group of people who lived in a certain geographic area at a certain time. In the Arab world, they are called the Hindu numerals for that reason. And the United States is trying to move to the correct attribution of history, of how these numerals came about. This system of numerals was really incredible – it’s one of the greatest mathematical contributions in history. Its really the ‘0’ that enables us to write large numbers and do science the way we do today. And the history of this remarkable way of writing large numbers is one of the things that people are trying to understand. Not in India, but in Holland! Researchers in Holland are trying to figure out the history of one of the greatest scientific contributions of all time. And again, my suggestion is, for the Sanskrit students who are interested in this, it would be nice if India helped in this project because the manuscripts are all here. I always find it a shame that the interest is greater outside India than in India, when this is India’s contribution. India shouldn’t be afraid to own, study, and recognise this contribution. You’ll notice that some textbooks in India go out of their way to call it the Arabic system and not even mention that it was invented in India. It would be nice if this kind of culture was changed. Because India can actually contribute a lot in understanding the history of this if it got interested in its own things! There was a big controversy about the Pythagorean theorem last year, about whether it was discovered in India. And in these debates, nobody gives a shred of evidence either way. And in Indian school textbooks, there’s this big picture of Pythagoras. And there’s no picture or mention of anything that was ever done in India. So of course, obviously the debates [in India] will look like that. The way our textbooks are – they have no historical analysis. So here’s the truth: that story about Pythagoras that is shown in Indian textbooks, the fact that he discovered and proved the Pythagorean theorem – well, there’s no shred of evidence that he ever proved the Pythagorean theorem. Nobody has any source on that. It’s just a legend. On the other hand, there is a concrete source in India – namely, Baudhayana’s Sulba Sutra – that is before Pythagoras, and that has the Pythagorean theorem stated absolutely clearly. And, that goes back to around 800 BCE. The Pythagorean theorem is clearly stated there, with an interpretation in terms of areas that leads to a proof, and in other Indian works as well. But again, that connection to modern mathematics and being able to tell the public accurately – that’s the beauty of what Sanskrit students can do in the future. Read these things. Know about them. Write about them. Do it in an accurate way. It’s not your agenda to show that everything originated in India. It’s your agenda to show what originated in India in an accurate and clear way. How will the world make a judgement if India doesn’t begin to be its own ambassador about the things that happened here? Please make it your duty to contribute accurately to our knowledge base while helping to preserve the treasures of India. I wish you great success in your future endeavours! ..ಅದಕ್ಕೇ ಸ೦ಸ್ಕೃತ ಗ್ರ೦ಥಗಳನ್ನು ರಕ್ಷಿಸಿಕೊಳ್ಳಿ, ಅದನ್ನು ಸದುಪಯೋಗ ಪಡಿಸಿಕೊಳ್ಳಿ ಎನ್ನುವುದು..
..ಆದರೆ, ಜಾತ್ಯತೀತತೆ ಸೇರಿದ೦ತೆ ಇನ್ನಿತರ ವಿಷಯಗಳೇ ನಮ್ಮನ್ನು ಹೆಚ್ಚು ಆವರಿಸಿಕೊ೦ಡು ಆ ಭಾಷೆಗಳನ್ನೇ ಮರೆಯುತ್ತಿದ್ದೇವೆ. ಇದು ಹೀಗೆ ಮು೦ದುವರೆದರೆ, ಮ್ಯಾಕ್ಸ್ ಮುಲ್ಲರ್ ನಮ್ಮ ವೇದ, ಪುರಾಣಗಳನ್ನೆಲ್ಲ ಕದ್ದು ಇ೦ಗ್ಲಿಷ್‍ಗೆ ಭಾಷಾತರಿಸಿಕೊ೦ಡು ಇ೦ಗ್ಲಿಷ್‍ನವರ ಹೆಸರು ಹಾಕಿಕೊ೦ಡ೦ತೆ, ಈಗಲೂ ಹಾಗೇ ಆಗಬಹುದು. ಗಣಿತ ಕ್ಷೇತ್ರದ ಬಗ್ಗೆ ಬಹುಶಃ ಸ೦ಸ್ಕೃತ ಭಾಷೆಯಲ್ಲಿ ಬರೆದಿಟ್ಟಿರುವ ಮಾಹಿತಿ ಇನ್ನೆಲ್ಲೂ ಇಲ್ಲ..
..ಆದರೆ, ಇವತ್ತಿನ ಸ್ಥಿತಿ ಹೇಗಿದೆಯೆ೦ದರೆ ಮಕ್ಕಳು ಅಪ್ಪಿ ತಪ್ಪಿ ಸ೦ಸ್ಕೃತದ ಬಗ್ಗೆ ಕೇಳಿದರೂ ಪೋಷಕರಿಗೆ ಗೊತ್ತಿಲ್ಲ..
..ಒಮ್ಮೆ ಸ೦ಸ್ಕೃತ ಗ್ರ೦ಥಗಳನ್ನ ತೆಗೆದು ನೋಡಿ. ಅಲ್ಲಿ ತಿಳಿಸಿರುವ ವಿಚಾರ ಇವತ್ತು ನಾಳೆಗಾಗುವಷ್ಟಿಲ್ಲ. ಇನ್ನು ನಮ್ಮ ನಿಮ್ಮ ತಲೆಮಾರಿಗಾಗುವಷ್ಟು ವಿಷಯ ಬರೆದಿಟ್ಟು ಹೋಗಿದ್ದಾರೆ. ಇ೦ದು ನಾನೊಬ್ಬ ಯಶಸ್ವಿ ಗಣಿತಶಾಸOಉಜಞನಾಗಲು ಸ೦ಸ್ಕೃತ ಸಹಾಯ ಮಾಡಿದೆ ಎ೦ದರೆ, ಅದರಲ್ಲಿ ಅದೆಷ್ಟು ಸಾಹಿತ್ಯದ ಕೃಷಿ ನಮ್ಮ ನಿಮ್ಮೆಲ್ಲರಿಗಿ೦ತಲೂ ಮೊದಲು ನಡೆದಿತ್ತು ಎನ್ನುವುದು ಊಹಿಸಬಹುದು..
..ಒಮ್ಮೆ ಸ೦ಸ್ಕೃತ ಭಾಷೆಯಲ್ಲಿರುವ ಗಣಿತ ಸ೦ಬ೦ಧಿ ಗ್ರ೦ಥಗಳೇನಾದರೂ ಇ೦ಗ್ಲಿಷ್‍ಗೆ ಅಥವಾ ಸ್ಥಳೀಯ ಭಾಷೆಗೆ ಅನುವಾದವಾಗಿ ಅದನ್ನೆಲ್ಲ ನಮ್ಮವರು ಓದಿದರೆ, ಖ೦ಡಿತವಾಗಿಯೂ ಭಾರತದಲ್ಲಿ ಮತ್ತೆ ರಾಮಾನುಜಮ್‍ರ೦ಥವರನ್ನು ಬಹಳ ನೋಡಬಹುದು..
..ಹೇಗೆ ಅರಿಶಿಣ, ಗಾಯತ್ರಿ ಮ೦ತ್ರ, ಯೋಗವನ್ನು ಬೇರೆ ದೇಶಗಳು ತಮ್ಮ ಹೆಸರಿಗೆ ಪೇಟೆ೦ಟ್ ಮಾಡಿಕೊಳ್ಳಲು ಪ್ರಯತ್ನಿಸುತ್ತಿವೆಯೋ ಇದೂ ಹಾಗೇ. ನಮ್ಮ ಎಷೆ್ಟೂೀ ಆವಿಷ್ಕಾರಗಳ ಕಥೆಯೂ ಹೀಗೇ ಆಗುತ್ತದೆ..